Navman iCN 530 in-car GPS navigation system with 3.5-inch touch screen and remote control operation. Navman iCN 530 is preloaded with GREAT BRITAIN maps. Navman iCN 530 has been discontinued. Accessories, spares and parts are still available for your iCN 530. Navman iCN 530 satellite navigation system features a 3.5-inch colour touch screen display, points of interest and auto day/night display. 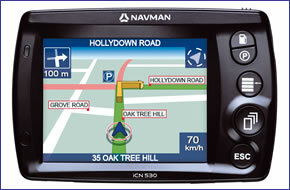 The Navman iCN 530 is a brand new 2006 sat nav model and is preloaded with 2006 TeleAtlas maps of GREAT BRITAIN, a set of CD-Roms is also included with detailed street-level mapping for the UK and Western Europe (2005 map data). European mapping requires installation via a PC and one or more 512MB SD cards may be required to accommodate additional mapping. The Navman iCN 530 features turn by turn navigation with voice guided instructions. On-going journey information such as ETA and distance remaining is displayed. The Navman iCN 530 also features a back lit keypad and night view navigation screen. To accommodate Europe you will need to expand the memory by purchasing one or more blank 512MB SD cards (maximum compatible size). However, the Navman iCN 530 is flexible regarding installing the countries (or parts of countries) that you require and the internal memory may be adequate. Navman iCN 530 has been designed to be plug and play, and as such can be transferred from vehicle to vehicle with ease by the user. The Navman iCN 530 is powered with a 12-volt adaptor cable in-car and includes a windscreen suction mount. Navman iCN 530 is supplied with preloaded mapping for GREAT BRITAIN. To install other regions of Europe a PC is required. The Navman iCN 530 has an internal memory of 256 MB. The Navman iCN 530 is compatible with SD cards up to 512 MB from SanDisk or Integral. Other cards are not supported. The following countries are available on the CD-roms included with the Navman iCN 530: Andorra, Austria, Belgium, Denmark, Finland, France, Germany, Gibraltar, Ireland, Italy, Liechtenstein, Luxembourg, Monaco, Netherlands, Norway, Portugal, San Marino, Spain, Sweden, Switzerland, United Kingdom and Vatican City. Available Navman iCN 530 maps include New Zealand and Australia. View the complete range of maps. Although the Navman iCN 530 has been discontinued, a number of accessories are still available to buy from ActiveGPS. These accessories and spares include: coiled power cable, windscreen mounting bracket, AC mains power pack, remote control and external GPS antenna.